Derbyshire captain Billy Godleman was delighted for his team-mates as they ended a long wait for a home win in the County Championship by beating Middlesex. The 101-run victory on the final day of the Division Two match at Derby was just reward for their efforts, insisted Godleman. 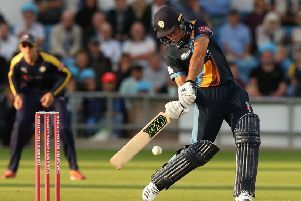 A run of 23 home championship matches without a win stretching back 1,306 days to September 2014 was finally broken when Duanne Olivier bowled Tim Murtagh to end spirited resistance by the Middlesex tail. The captain said: “I’m really chuffed, not just for myself but for all the guys who have fought really hard over the last four days. “I think looking back the two wickets we got just before lunch were really crucial. Middlesex were set an improbable target of 442 but the visitors took the match deep into the last session through a ninth wicket stand of 106 between James Harris (64 not out) and Tom Helm. They lost two wickets in the first three overs of the morning with Max Holden and Ollie Rayner falling to Olivier and Hardus Viljoen. It was now a question of how long Middlesex could delay the inevitable and John Simpson and Paul Stirling showed the sort of application required. They denied Derbyshire for 20 overs, adding 65 but the introduction of Luis Reece’s medium pace from the City End broke the stand in the 23rd over of the day. Madsen’s off-spin had been introduced to improve the over rate but he delivered Simpson lbw for 24. Harris and Helm played impressively to take the match into the final session. Helm completed a maiden first-class 50 before he was lbw to Critchley and Olivier returned to take his eighth wicket and seal victory.